CHICAGO (AP) — Raising kids costs a lot of money, so when they finally strike out on their own it stands to reason that parents would have more money to spend, save or invest. 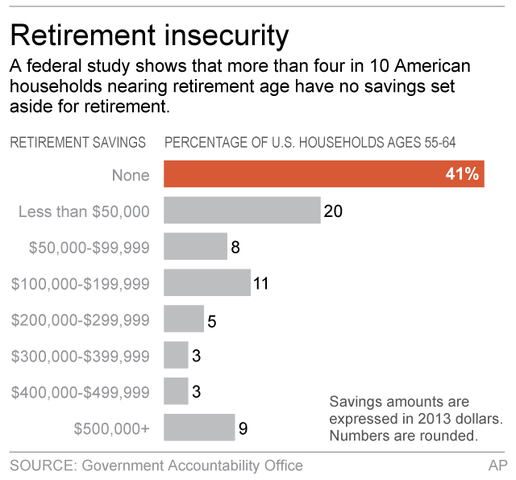 How they spend that money can have large consequences for their retirement security. A report by Boston College's Center for Retirement Research found that empty nesters do increase savings, but the increases are "extremely small," suggesting that baby boomers may be losing out on a critical opportunity to save for retirement. "If you want to believe that households are saving enough for retirement, then you have to believe that their savings will increase dramatically when the kids leave and we're not seeing that," says Geoffrey Sanzenbacher, a research economist at Boston College's Center for Retirement Research and co-author of the report. The Agriculture Department has estimated that a middle-income family would spend about $245,340 raising a child born in 2013 to age 18. That includes food, housing childcare and school but not higher education. So, in theory at least, it would seem, "there is this sweet spot when the kids are off the payroll," says Joy Kenefick, managing director of investments at Wells Fargo Advisors. "Maybe the mortgage is paid off and people are looking at another five to 10 years of work where they can really maximize savings and get ahead," she said. However, unlike previous generations, Kenefick says, young adults today take longer to be up and running on their own. A study by the Pew Research Center released in May says that in 2014 about a third of adults 18 to 34 were living with parents. It attributed the phenomenon to a postponement of marriage and economic factors, including employment and wages. Even when kids do move out, Kenefick said, household spending may not actually go down. "There is no magic switch," she says. "We counsel our clients that when you retire, your level of consumption is not going to change." Kenefick says parents often continue supporting their kids by picking up costs like student-loan payments, auto insurance, phone bills and other line items. In fact, in the first five years of retirement, she says, spending can actually increase, as people start to "re-nest," finally having the extra cash for things like home-improvement projects, or maybe some travel while still relatively young and healthy. Karen Courtight of Evanston, Illinois, says she and her husband, Steve, have changed their spending habits since their two sons, 24 and 27, began living on their own and supporting themselves. "Nine months ago we got a new car," she says. "We hadn't got a new car in probably 12 years." Courtright works as a freelance marketing researcher. Her husband is an attorney. She says they were both fortunate to start putting money into retirement savings when they were younger, but the Great Recession changed their plans and made them nervous about retiring too soon. "The idea of slogging it out for another 10 years, at our age, is not what we really want to do," says Courtright, 58. "But, it's impossible to know when the right time to retire is. Financial planners can't tell you, especially in a down market, so all this money we've saved is not working for us." Rather than reflecting a conscious choice on the part of households, Sanzenbacher says, the savings issue may have more to do with changes in employment benefits, specifically the rapid disappearance of the old defined-benefit pensions. "Savings for retirement wasn't really a conscious thing before the 1990s," he says. "With pensions and match funding, lots of employers were automatically saving on your behalf." The Boston College study says households increase saving through their 401(k)s, by 0.3 to 0.7 percentage points after kids leave. According to a recent report from the Government Accountability Office, about 55 percent of households age 55-64 have less than $25,000 in retirement savings, including 41 percent who have zero. Teresa Ghilarducci, an economist at the New School for Social Research, says there is a very real likelihood the number of poor and near-poor retirees will increase dramatically in the coming decades. Using the Organization for Economic Cooperation and Development's measure of impoverishment and current rates of population growth as a guide, Ghilarducci estimates the number of elderly poor will increase from 8.9 million in 2010 to 25 million in 2050, "representing a rate of poverty among seniors not seen since the Great Depression."